Anatech Electronics offers a large veriety of standard rf filters specifically design for wireless standard and legacy wireless bands and standards. Anatech Electronics offer band pass filters, duplexers, and band stop / notch filters covering all LTE Bands, from band 1 thru band 44. All FDD LTE RF filters include, but not limited to Cellular 850, GSM 900, LTE 700 , WiFi wirelss LAN , other band can be found within our standard products. RF filter for wireless communication comes in various topologies such as Band pass, Duplexers, Triplexers, and Multiplexers. 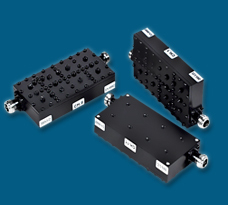 Each one delivers exceptional overall performance and reliability along with excellent rejection characteristics, low insertion loss, high return loss, and low levels of passive intermodulation distortion (PIM). Many are designed for outdoor use. We can find the Bandpass Filter/Duplexer for you!